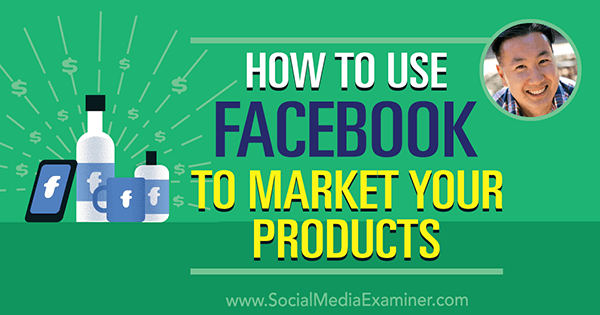 Have you tried using Facebook ads to promote your products? 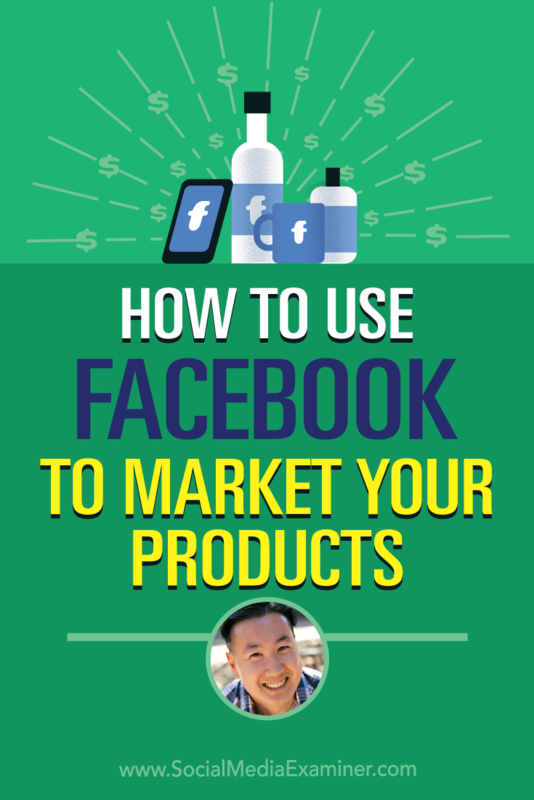 To find out how to market products via Facebook, I interview Steve Chou. In this episode, I interview Steve Chou. Steve and his wife run an ecommerce site that sells handkerchiefs and linens at BumblebeeLinens.com. He’s also host of the My Wife Quit Her Job podcast and the website MyWifeQuitHerJob.com, where he teaches people how to sell physical products online. Steve explains which Facebook ad types he uses to sell his physical products. You’ll discover how Steve uses email and Facebook ads in tandem. 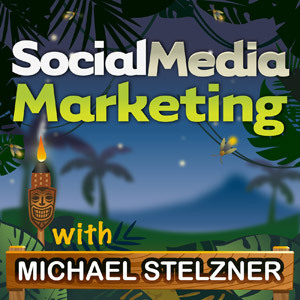 How to Use Facebook to Market Your Products featuring insights from Steve Chou on the Social Media Marketing Podcast. As Steve and his wife were preparing for their wedding, his wife wanted a nice handkerchief because she expected to cry during the service. After shopping around, they imported a bunch of handkerchiefs from Asia. After using only a few, Steve and his wife listed the rest on eBay, where they sold like hotcakes. Later, when Steve’s wife became pregnant with their first child, she wanted to quit her six-figure income job. 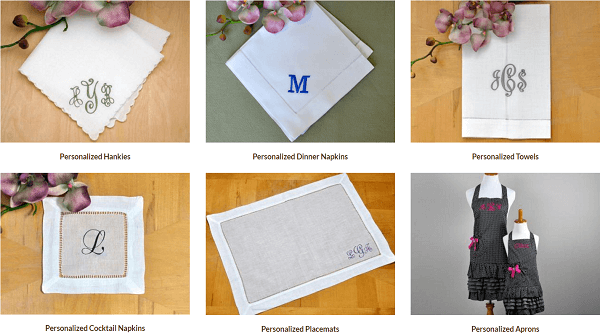 They reconnected with the handkerchief vendor and opened their online store, Bumblebee Linens. At first, Steve worked as a microprocessor designer by day, and after the baby went to bed, Steve and his wife ran the business. It became such a success that they maintained their income even after his wife quit her job. Steve explains that soon afterward, their friends began wanting to have kids and quit their jobs, and they kept asking Steve how to launch an ecommerce store. Instead of answering the same questions over and over again, Steve began blogging about his experiences running the store. That’s how MyWifeQuitHerJob.com got started in 2009. Steve created MyWifeQuitHerJob.com to document their experiences. To generate sales in the early days, Steve used Google AdWords. His brother-in-law worked at Google in the AdWords division and showed Steve how to use it. Back in 2007, Steve generated a lot of sales via clicks that cost him about 10 to 15 cents. Steve says online content also helped generate sales. They wrote articles to help brides and provide craft ideas for their products. After three to six months, the articles started ranking in search engines and sent traffic to their store, too. Today, Bumblebee Linens sells handkerchiefs, linen napkins, linen towels, lace parasols, aprons, and more. Steve says the store has several target audiences. The handkerchief audience includes people planning weddings and an over-55 crowd. Event and wedding planners are the target audience for napkins and moms are the audience for Mommy & Me aprons. The company has in-house embroidery machines for personalizing their products. Bumblebee Linens has many products and therefore several audiences. Listen to the show to learn more about the audience and the content on MyWifeQuitHerJob.com. Steve explains that a win-back campaign targets people who have already purchased from your shop because those people are more likely to buy again. To run this type of campaign, you need to figure out who those people are, and if they haven’t purchased within a certain timeframe, give them an incentive to come back. You can automate a win-back campaign with an online merchant system. For example, if someone hasn’t purchased from Bumblebee Linens in 60 days, they automatically receive an email and a Facebook ad with a 10%-off coupon. To automate the Facebook component of the campaign, Steve says the ecommerce system Klaviyo allows Bumblebee Linens to export a specific segment (in this case people who haven’t purchased in 60 days) and create a Facebook custom audience that’s updated dynamically. So each day, customers who haven’t purchased in 60 days are added to that audience automatically and customers who make a purchase are removed. As the campaign continues, Steve uses a discount ladder. If a customer continues not to buy, he or she receives a 15%-off coupon after 75 days and then a 20%-off coupon after 90 days. With a discount ladder, your goal is to offer the smallest coupon needed to complete the sale. If you can get someone with the 10%-off coupon, that’s the best-case scenario. Steve creates win-back campaigns through email and Facebook ads. Steve adds that you can do this campaign with another provider; however, one of the key things about making this hands-off is the Dynamic Custom Audience in Facebook. Other software would require doing these updates manually. Steve shares that win-back campaigns work well for Bumblebee Linens because the company has established trust with returning customers. The conversion rates are in the double digits. In terms of the return on ad spend, for every $1 spent, the company makes $5 to $6. I ask Steve whether win-back campaigns work better on certain platforms. Steve says the campaign works best if you share the coupon on different platforms simultaneously because each person spends time online in different places (email, Facebook, or surfing the web). However, Steve shares that if he had to rank the importance of each platform for his store, email is best, then Facebook, followed by Google retargeting. Listen to the show to hear how you can apply this strategy to digital products. 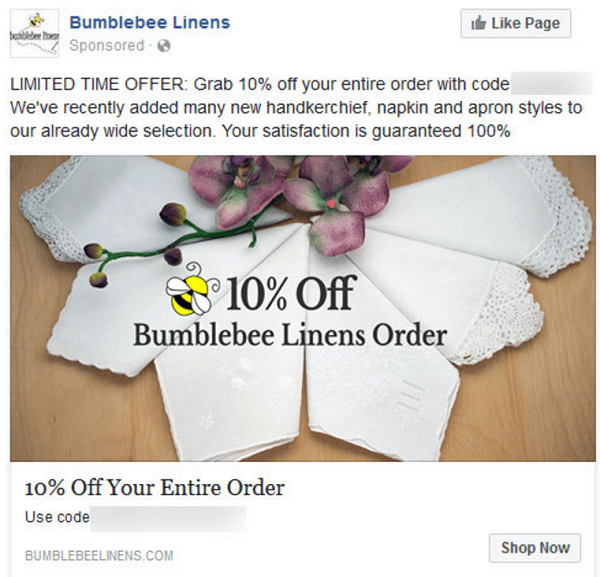 Steve uses Facebook’s Dynamic Ads for customers who have visited the Bumblebee Linens website but haven’t made a purchase. Steve says dynamic ads are also helpful when you have a lot of products. Bumblebee Linens has 480 SKUs, which makes it cumbersome to run specifically retargeted ads to a customer. However, with dynamic ads, you can upload an entire product list to Facebook and show customers ads that reflect the products they view on your site. 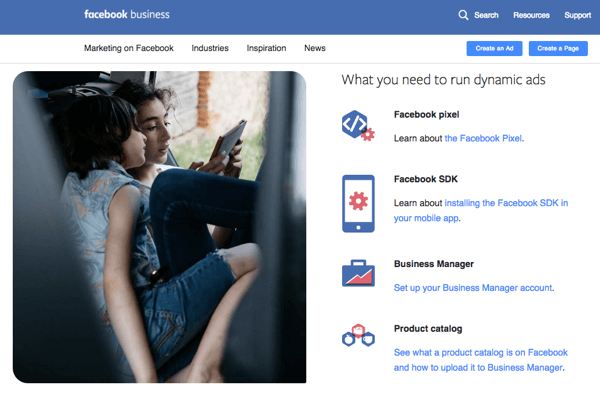 To set up Facebook dynamic ads, ecommerce platforms like Shopify have plugins that cost about $50 per month or you can set up dynamic ads yourself through Facebook. As an engineer, Steve is comfortable implementing dynamic ads himself and thinks anyone who’s comfortable with technology can do it, too. If you do set up dynamic ads yourself, Steve says you need to be careful about running out of stock. You have to keep your product list up to date on Facebook because you don’t want to show an ad for something you can’t sell. Dynamic ads can be created via Facebook or a specialized plugin. When I ask Steve how you choose what to display in a dynamic ad, Steve says you choose variables that work like placeholders for an image, product title, description, price, and whatever else you want to display in the ad. The dynamic ad then fills in the placeholders with specific images and text from your product list, based on the product that the customer viewed on your site. Listen to the show to hear Steve discuss the returns his dynamic ads generate. Steve also uses email and Facebook to target customers who add items to their cart but abandon it before completing the purchase. When I ask what the cart abandonment rate for Bumblebee Linens is, Steve explains that the abandonment rate is definitely double digits, but not as high as you might think. His customers have already entered their email address to start checkout, which means they have a strong intent to make a purchase. If someone doesn’t make it to the thank-you page, you can run cart abandonment ads based on what customers had in their cart. Steve says that whenever users start checkout and give their email but they don’t finish the transaction, Bumblebee Linens follows up with an email and Facebook campaign. The campaign’s email component follows a three-email sequence. Four hours after a customer abandons his or her cart, Bumblebee Linens sends the first email saying, “We noticed you started the checkout process at Bumblebee Linens but didn’t quite finish. Come on back.” In the email, Steve says it’s important to show the exact items that the customer put in the cart. Steve’s email also includes a button that customers can click to open a shopping cart that contains their items and complete the checkout process quickly. Steve says for his store, the first email converts 14% of the people to come back, the second email is about 4%, and the third is half of that. However, Steve explains that you can recover 25% to 30% of your people if the last email includes a coupon code or incentive. You can also use a discount ladder similar to the process he follows for a win-back campaign. When the first email is sent, Steve says he also begins the Facebook component of the campaign. People who abandon their carts see a Facebook ad based on a Facebook custom audience (also similar to the win-back campaign). Steve says you can create this custom audience by designating a specific segment of people who abandoned their cart within a certain amount of time. I ask how tag-based email marketing and merchant systems handle emails, dynamic Facebook ads, and checkout. Steve says that Klaviyo can handle all of the email marketing but not checkout. A separate system handles customer transactions. Listen to the show to discover Steve’s thoughts about the different tag-based email marketing systems. Browse abandonment occurs when people visit your site, maybe look at a few products, and then leave without ever starting the checkout process. To follow up with these potential customers, Steve says that having their email addresses is crucial because an email allows you to track the customer’s activity on your website. For example, Steve explains that Klaviyo can track a website visitor by associating his or her cookie with the email address. Steve collects email addresses through a variety of pop-ups. 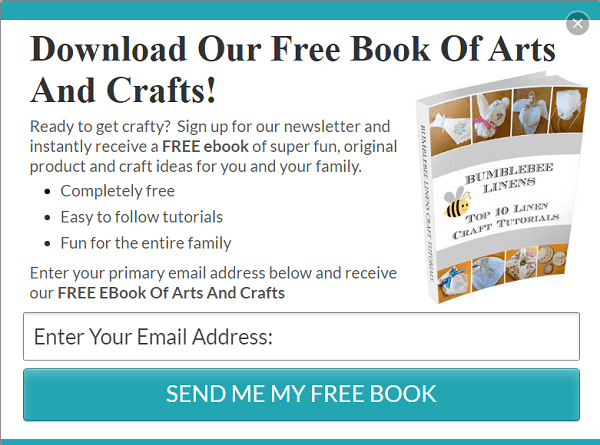 To get email addresses, Bumblebee Linens offers ebooks as lead magnets. For instance, the website offers someone looking at handkerchiefs an ebook about arts and crafts with handkerchiefs. Visitors looking at napkins are offered an ebook about napkin folding. To offer the ebooks, Steve says Bumblebee Linens displays a pop-up that can be triggered by a timer, exit intent, slide-ins, or other standard tools. Steve thinks the pop-up converts at about 1.5% to 2%. After someone provides an email address, Steve has a 100-day email sequence that tries to warm up the potential customer to the Bumblebee Linens brand and provides lots of content. Steve says the sequence is so long because in ecommerce these days, customers need to interact with a store 4-8 times before they make a purchase. Often, people browse but aren’t ready to buy, so you have to keep your company in their minds until they are ready. After someone browses the site but doesn’t start checkout, Steve says one email converts especially well. This email shows the person the exact product they viewed along with a list of recommendations. Steve says Klaviyo also helps him manage browse abandonment emails. Given all of the different types of campaigns Steve runs with Klaviyo, I ask how much it costs. Steve says it’s probably more expensive than software like AWeber and ActiveCampaign, but Klaviyo is well-suited for ecommerce stores and totally worth it. The cost for up to 500 contacts is $50/month and up to 3,000 contacts is $175/month. Steve says that for him, the integration between Klaviyo and Facebook is key (and included with the software). You can automatically and dynamically export custom segments of your customers to create Facebook custom audiences. 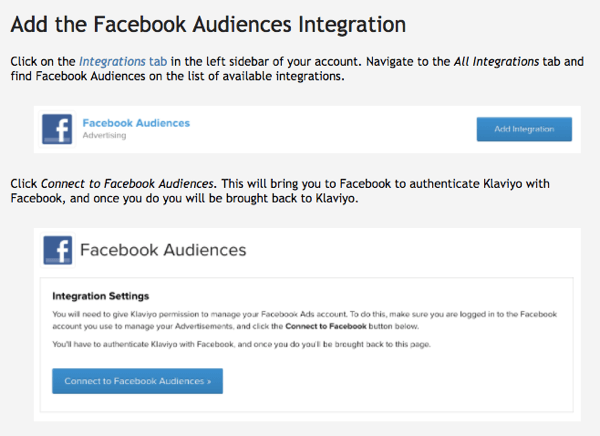 Klaviyo’s Facebook Audiences integration is easy to use. Listen to the show to hear how Steve customizes his campaigns to follow up with customers who purchased dinner napkins. In the free plus shipping offer, Bumblebee Linens gives away an item for free and charges only for shipping and handling (about $5). Steve says that the free plus shipping offer helps his Facebook ads stand out. That’s important because Facebook ads are interrupting someone who’s browsing their news feed and catching up with friends. A free, high-quality lace handkerchief can be worth the interruption. Steve explains that with this offer, his goal is to break even or make a tiny bit of money and acquire a new customer because customers are more likely to buy again. After users click the Facebook ad and land on the site, they must give an email address before they can click the Add to Cart button. Then Bumblebee Linens begins contacting the customer via the 100-day email sequence. To get customers into the database, Steve uses a free plus shipping offer. An upsell makes the free plus shipping offer more valuable. 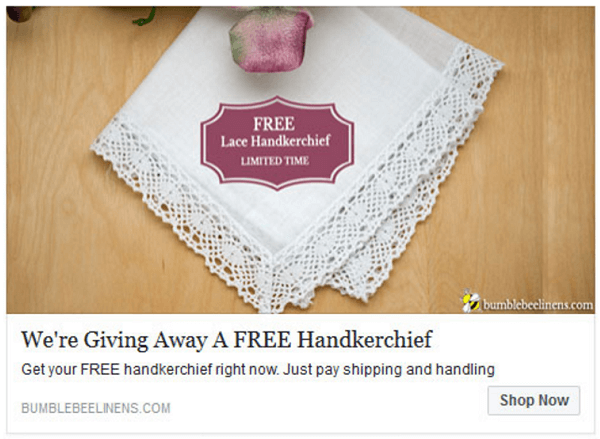 After someone adds the free handkerchief to their shopping cart, they see a one-day offer to get 35% off a specific $50 handkerchief bundle. To receive the offer, the customer has to buy that day. Although Bumblebee Linens probably takes a little loss with the free item alone, Steve explains that the upsell makes the free plus shipping offer profitable. Steve says the free plus shipping offers are video ads because they convert so well. Steve creates a lookalike audience of people who watch 75% of their video and run the offer to those people, too. Gradually, the audience is refined down to the most likely buyers. Listen to the show to hear about post-purchase upsells and the integration available with 1ShoppingCart, which is what we use. 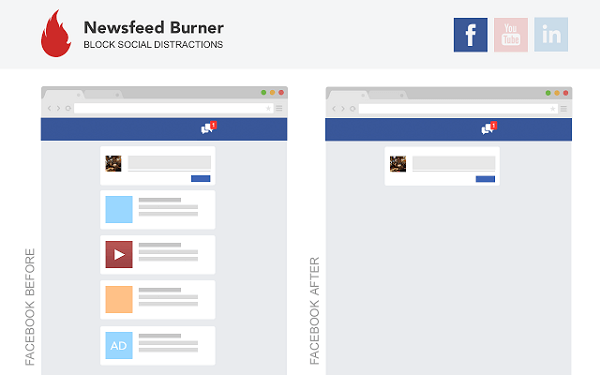 Newsfeed Burner also eliminates the feed for YouTube and LinkedIn. Listen to the show to learn more and let us know how Newsfeed Burner works for you. Learn more about Steve on MyWifeQuitHerJob.com. Sign up for Steve’s free mini course. Listen to the My Wife Quit Her Job podcast. Take a look at Klaviyo. Create Facebook custom audiences and dynamic ads. Set up a funnel analysis in Google Analytics. Explore ActiveCampaign, Drip, AWeber, and 1ShoppingCart. What do you think? What are your thoughts on marketing physical products with Facebook ads? Please leave your comments below.